Preheat oven to 350 degrees. Blend wheat flour and white flour in a bowl. Set aside. Combine vegetable oil, peanut butter, and water. Add flour, one cup at a time, forming a dough. You will need to blend the final flour by hand, kneading until a nice firm ball of dough is formed. (Takes a bit of kneading.) Let ball of dough stand for about 10 minutes to allow the gluten to relax. Makes for easier rolling. Roll dough to about 1/4 inch thickness on a sheet of waxed paper. Cut with desired cutter. Re-roll scraps to make more biscuits. How many biscuits you get depends on the size of the cutter you use. Score the tops of the cookies with a fork so the steam that builds up inside the cookies will release. Bake on an ungreased cookie sheet for about 25 minutes, turning the pan a couple of times during baking. Cookies should be hard to the touch before removing from the oven. You may need to increase baking time. Do this in five minute increments.I usually have to bake about 30-35 minutes. Cool, then store in a zip-lock baggie on the shelf. No refrigeration necessary. 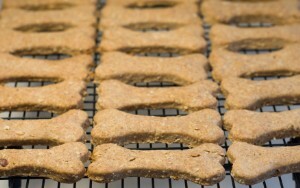 I found this second recipe on Martha’s website, http://www.marthastewart.com/264802/homemade-dog-biscuits but didn’t have the wheat germ so wasn’t able to make them… I’d like to try them soon, however!